You may have wondered what the difference is between a resistive and capacitive touchscreen. You may have questioned which one is best for your situation. Chances are you have experienced both resistive and capacitive technology. Despite this, you may not have known what the technologies were called – or considered the implications behind each one. Then again, you might know all about capacitive and resistive touchscreens and the advantages and disadvantages of each. If you do, perhaps you can chime in on the discussion. If you have found your knowledge of resistive versus capacitive technology lacking, then read on, and hopefully, you’ll learn a few things. Resistive touchscreens rely on the pressure of your fingertip – or any other object – to register an input. These touchscreens consist of two flexible layers with a gap of air gap in-between. In order for the touchscreen to register an input, you must press on the top layer using a small amount of pressure to depress it enough to make contact with the bottom layer. The touchscreen will then register the precise location of the touch. Rather than relying on pressure, capacitive touchscreens instead sense conductivity to register input – usually from the skin on your fingertip. Because you don’t need to apply pressure, capacitive touchscreens are more responsive than resistive touchscreens. However because they work by sensing conductivity, you can only use capacitive with objects that have conductive properties, which ideally includes your fingertip or a special stylus designed with a conductive tip. Resistive touchscreens have historically been the technology of choice in the rugged handheld industry. Capacitive touchscreens, on the other hand, are more common among consumer devices, like cell phones. Resistive touchscreens have been a popular choice for rugged handheld manufacturers for a number of reasons. Capacitive technology in both industries, however, is growing in popularity. In designing the Archer 2 Rugged Handheld, we weighed these benefits and felt strongly that capacitive technology offered a lot to the rugged handheld industry. Stylus versatility: Because resistive technology is based on pressure, you can use anything for a stylus. You don’t need a special capacitive-tipped stylus. Higher sensor resolution: Resistive touchscreens are densely packed with sensors; therefore, a finer tip will work better on resistive touchscreens than capacitive touchscreens. When an application’s buttons are small, users might prefer a fine-tipped stylus. Register fewer inadvertent touches: In many cases, users might prefer a capacitive touchscreen over a resistive screen for its responsiveness and sensitivity. Yet, there are instances where users might not want a high-sensitivity display. Users might prefer a resistive touchscreen when inadvertent touches on the screen are anticipated – such as when liquids (think rain) fall on the touchscreen. A resistive touchscreen will not pick up light touches. To accommodate for inadvertent touches on the Archer 2’s capacitive touchscreen, we developed touch profiles, a software which offers settings to optimize the touchscreen for different scenarios. Resistive has been the norm: Resistive technology has historically been the norm among rugged handhelds. Windows Mobile apps have been designed for resistive touchscreens, incorporating small icons that work well with a fine-tipped stylus, but not with a larger fingertip. This major factor lead rugged handheld manufacturers to stick with resistive touchscreen technology. While software developers are designing apps that are capacitive touchscreen-friendly, we have provided an interim hold-to-zoom feature on the Archer 2. This feature accommodates for small icons and makes it easier to press them with your fingertip. We also optimized the Archer 2’s home screen and icons for its capacitive touchscreen. They are large and easy to access. Cheaper: Resistive touchscreens have been cheaper than capacitive touchscreens – another reason rugged handheld manufacturers stuck with resistive technology. However, capacitive touchscreens are becoming more prevalent and affordable. Durability: Generally, the display is the most vulnerable part of a handheld device. One advantage of capacitive touchscreens is they tend to be more rugged than resistive touchscreens – especially under heavy use. Heavy users may find frequently used areas on a resistive touchscreen wear down and become unresponsive. Capacitive touchscreens don’t wear down. In particular, the touchscreen on the Archer 2 is especially rugged. Made with chemically strengthened glass, its touchscreen is incredibly resistant to scratches and other damage. 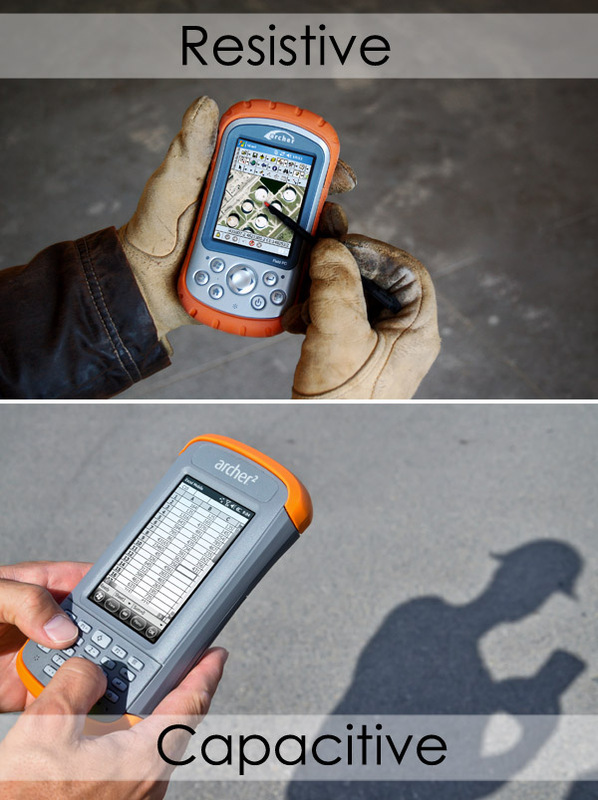 While the touchscreen is an Achilles’ heel for most rugged handhelds, the touchscreen on the Archer 2 is its strength. Reliability: If a capacitive touchscreen is pierced or broken, it will likely continue to work as usual – think about all the cracked smartphone screens you’ve seen people using. The screen can shatter and continue to function. On the other hand, resistive touchscreens will often stop working if any part of the screen is damaged. This is an important advantage of capacitive touchscreens because it allows a field worker to continue to collect data until they can get their screen repaired. With a resistive touchscreen, a field worker may have to forego further data collection until the screen is fixed. Future-proofed: The technology industry is leaning toward capacitive technology, but using a capacitive touchscreen on the Archer 2 will help ensure a smooth and compatible transition to future technologies. Multi-touch capability: Capacitive touchscreens are better suited for multi-touch capability. This means they easily register more than one input at a time. Eventually, when operating systems allow it, you’ll be able to pinch to zoom on a capacitive touchscreen. Resistive touchscreens are extremely limited in this function. Capacitive touchscreens, like the one on the Archer 2, were optimized for fingertip inputs. However, we ship the Archer 2 with a capacitive-tipped stylus, should you need one, and we continue to test styluses for maximum performance. We recommend using your fingertip with the Archer 2. If you do use a stylus, take advantage of the touch profiles we provided for the best possible results. We also encourage Juniper Systems’ partners to utilize Archer 2’s large display size while designing their software. 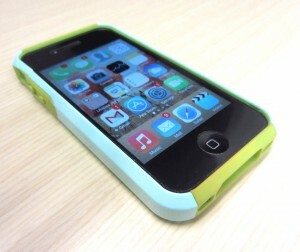 This will make it easier to use apps with a fingertip. Both capacitive and resistive technologies have pros and cons, but we anticipate the rugged handheld industry will continue to transition to capacitive technology. You should expect design trends in Windows Embedded apps to follow. Feel free to ask questions in the comments below or contact Juniper Systems to learn more about its products, including the Mesa 2 Rugged Tablet, which boasts a 7-inch capacitive touchscreen. This is an excellent description and assessment of those two technologies. 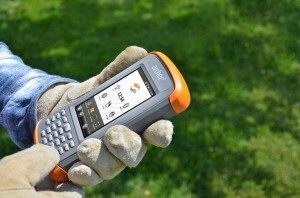 Anyone working with handhelds out there in the field should read this article. As almost always in rugged computing technology, what works best is relative. It always depends on the device, the application, the software, the expectations, and so on. Over the years, one conclusion I’ve come to many times is how important it is to properly match hardware and software. Windows, which has dominated the computing landscape for going on 20 years, was designed for use with a mouse, and that was the root of the problem for any attempt to make it work well with any other input method. On the other hand, the iPhone took off so spectacularly because Apple brilliantly matched capacitive multi-touch with its iOS, and Android followed in its footsteps. As pointed out, we now have this odd situation of virtually all smartphones using capacitive touch on iOS or Android, whereas almost all industrial and vertical market handhelds still use mobile versions of Windows with resistive touch. There are numerous reasons for that, but, on the vertical market side of things, it’s obviously a situation still in flux. Juniper is to be congratulated for analyzing this issue as thoroughly as it did, and I agree with going with capacitive touch for the Archer 2. Its implementation will undoubtedly evolve, but it was the right choice. Such kind words and great insight… thanks Conrad! You seem sure with his comments, however, I wonder why big corporations like Apple, Google does not use capacitive touch, resistive touch have which outstanding advantages than capacitive touch? The greatest article I have seen by far regarding this topic. Thank you! Thanks so much! We’re glad to hear that. Hello, Josh Egan! I don’t completely know the difference is between a resistive and a capacitive touchscreen until reading your post! Thanks for your sharing! Thanks for your detail article. I think, both Resistive and Capacitive Touchscreens have own advantages and depend on types of device, hardware and software, users can choose a right technology. To me, I prefer capacitive touch than resistive touch. Josh, Nice article. You have explained very well between resistive and capacitive touchscreens. And I agree with you that capacitive technology is growing very fast. It is nice article that give details of Resistive vs. Capacitive Touchscreens.It tell us difference between Resistive vs. Capacitive Touchscreens.I will enter the email to subscribe this blog.